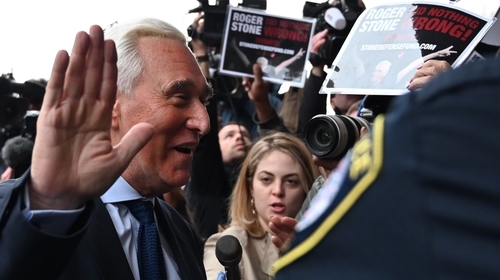 US President Donald Trump's long-time political ally Roger Stone has pleaded not guilty to charges that he tried to obstruct a congressional investigation into allegations that Russia meddled in the 2016 US presidential election. Mr Stone, a self-proclaimed "dirty trickster" and Republican political operative for decades, pleaded not guilty in a federal court in Washington, DC, to lying to Congress, obstructing an official proceeding and witness tampering. He is the latest member of Mr Trump's inner circle charged in Special Counsel Robert Mueller's Russia investigation and could face about 50 years in prison if found guilty on all the charges, although he is unlikely to receive such a harsh sentence, sentencing experts say. Prosecutors say Mr Stone, 66, lied to investigators for the House of Representatives Intelligence Committee who were looking into allegations that Russia hacked the emails of senior Democrats. The indictment against Mr Stone also says he told members of Mr Trump's 2016 presidential campaign that he had advance knowledge of plans by the WikiLeaks website to release damaging emails about Mr Trump's Democratic opponent in 2016, Hillary Clinton. US intelligence agencies say the emails were stolen by Russia. Mr Stone, a Republican operative since the days of the Watergate scandal that forced President Richard Nixon to resign in 1974, has been a friend and ally of Mr Trump for some 40 years. Outside after the hearing a small group of protesters waved Russian flags and a placard that said "Dirty Traitor" while his supporters called for Mr Mueller to be fired. The indictment did not indicate whether Mr Stone knew that Russians had stolen the emails by hacking into computers used by Mrs Clinton's senior campaign adviser John Podesta and the Democratic National Committee. The charges against Mr Stone marked the first time Mr Mueller's team has publicly tied the Trump campaign to WikiLeaks, and raised questions about what Mr Trump may have known prior to the public release of the stolen emails. Mr Stone, who is free on a $250,000 bond after being arrested at his Florida home last week, has accused Mr Mueller of "a raw abuse of power." Mr Trump has called the investigation a witch hunt and denied collusion. Russia has denied US intelligence community's finding that they interfered in the US political arena. 34 people have been swept up in the Mueller investigation. Those charged include Mr Trump's former campaign chairman and deputy campaign chairman, former national security adviser and his former personal lawyer.